Research has provided important lessons about developing and delivering high quality professional development to educators. Features identified as indicative of high quality professional learning experiences are the organization of the activity and its duration, the extent to which there is collective participation of teachers within an education institution, the degree of active learning opportunities, a content focus, and the degree to which the activity promotes coherence in professional development (Garet, Porter, Desimone, Birman & Suk Yoon, 2001). The evaluation of the Teacher Technology Leaders (TTL) PT3 Project at George Washington University (GWU) has been documenting the evolution of a professional development strategy exhibiting a number of these quality features. Over the three years of the project life, project staff and participants have been constructing knowledge and practice regarding the infusion of technology in teaching and learning by working first as individuals on their own knowledge development and then constructing multi-layered teams with representatives from university, school, and technology partners. The results thus far have shown that progress has been enhanced by collective participation with a content focus in the study of a particular problem. In the following article, the evolution of this approach is presented and implications for faculty development are discussed. Ludwig, M. & Taymans, J. (2005). Teaming:Constructing High Quality Faculty Development in a PT3 Project. 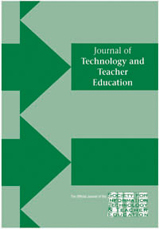 Journal of Technology and Teacher Education, 13 (3), 357-372. Norfolk, VA: Society for Information Technology & Teacher Education. Retrieved April 21, 2019 from https://www.learntechlib.org/primary/p/4487/. Council for Basic Education and The Johnson Foundation (2001). Eye of the storm: Promising practices for improving instruction. Washington, DC: Council for Basic Education. Information in this article is from work done during 2003-2004 academic year.